An example! If you want to change the color, font and width of the command prompt and do not like the default settings! Many users like to use the command prompt because they can type commands from the command prompt to perform tasks on their computer without using the Windows default interface. In all Windows operating systems, you can display the color of the screen text, wallpaper, text, and text background of the prompt in any color. Still too little color: ►► ColorConsole - for more color and fun with the Windows Console! 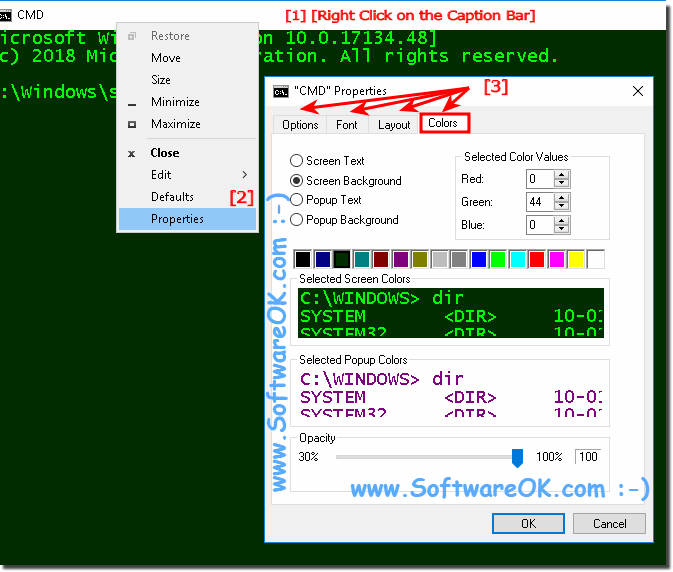 (Image-1) Command prompt, change color, font! In this FAQ you have learned how to change ergo customize the prompt colors for almost all operating systems; such as: Windows 10 (Redstone 4 & 5) Pro, Enterprise, Home, Windows 8.1, Windows 8, Windows-Server 2016, 2012, 2008, Windows 7 Basic, Professional, Starter, Ultimate. Windows-Console - FAQ-23: Command prompt, change CMD settings, color, font, ...?